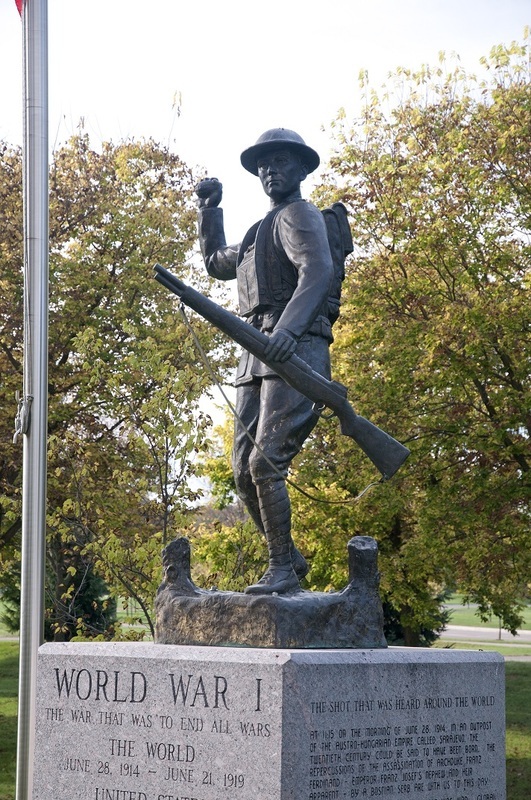 The memorial depicting World War I or The First World War on soldiers walk shows an American soldier holding his rifle getting ready to throw a grenade. 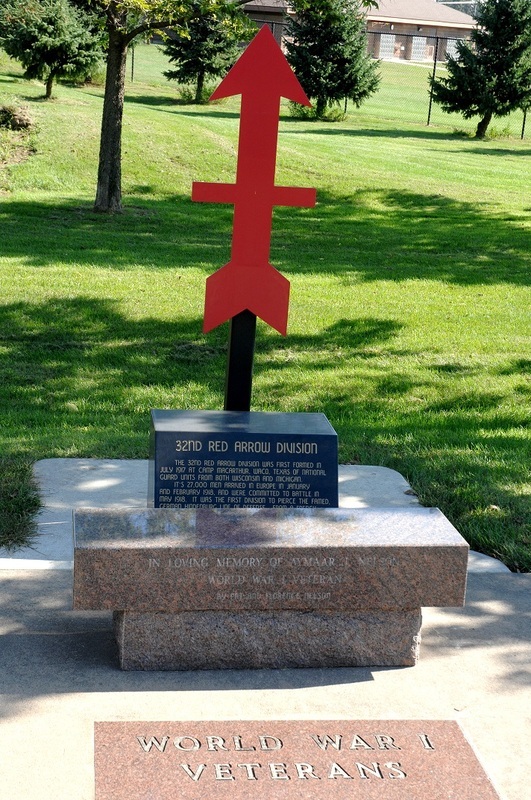 The memorial has 2 sides of information pertaining to this war that was known as: the war that would end all wars. The First World War started on June 28, 1914 and ended on June 21, 1919. 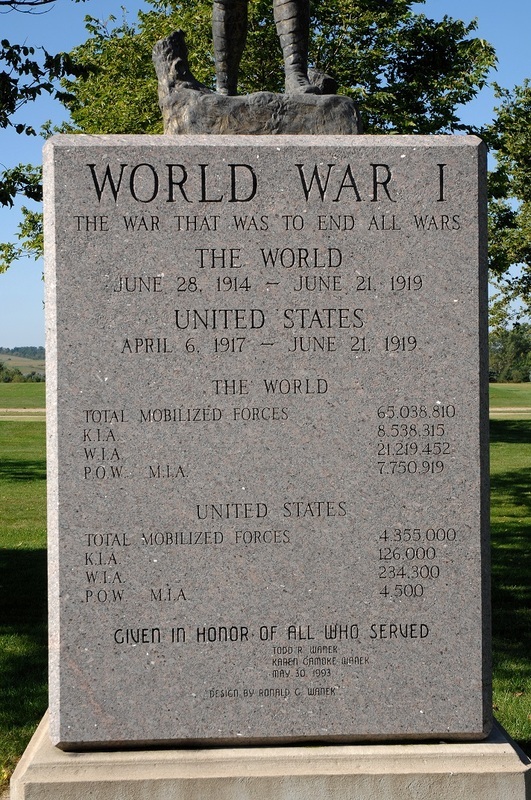 The United States did not enter the war until April 6th, 1917, almost 3 years after the war started. 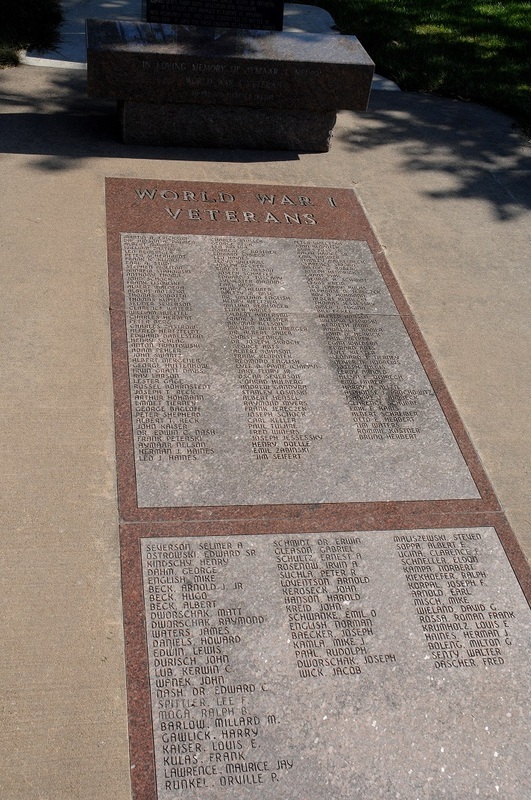 Embedded into the walk in front of the monument, are granite plaques paying tribute to local area Veterans who served in this war. 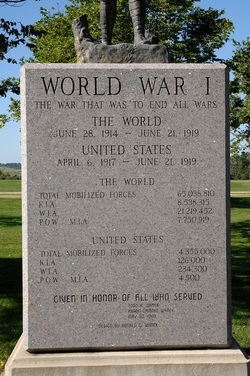 On the front of the memorial you'll find the statistics of the countries involved in the war and the casualties suffered which was a staggering number. ​It should be noted that the actual casualty statistics for World War I vary to a great extent; estimates of total deaths range from 9 million to over 15 million, ranking it among the deadliest conflicts in human history. This casualty rate was exacerbated by the technological and industrial sophistication, and tactical stalemate. It was the 5th-deadliest conflict in history, paving the way for major political changes, including revolutions in many of the nations involved. World War I, was a global war centered in Europe that began on 28 July 1914 and lasted until 11 November 1918. From the time of its occurrence until the approach of World War II, it was called simply the World War or the Great War, and thereafter the First World War or World War 1. In America, it was initially called the European War. Since the beginning of World War I in 1914, the United States, under President Woodrow Wilson, had maintained strict neutrality, other than providing material assistance to the Allies. Even in May 1915, when a German submarine sank the British ocean liner Lusitania, killing 128 U.S. citizens out of a total 1,200 dead, the United States, though in uproar, remained neutral. In January 1917, Germany announced that it would lift all restrictions on submarine warfare starting on February 1. This declaration meant that German U-boat commanders were suddenly authorized to sink all ships that they believed to be providing aid of any sort to the Allies. Because the primary goal was to starve Britain into surrendering, the German effort would focus largely on ships crossing the Atlantic from the United States and Canada. The first victim of this new policy was the American cargo ship Housatonic, which a German U-boat sank on February 3, 1917. Although Wilson tried hard to keep the United States neutral, by the spring of 1917, the situation had changed significantly, and neutrality no longer seemed feasible. Germany’s unrestricted submarine warfare was taking its toll, as American ships, both cargo and passenger, were sunk one after another. Finally, on April 2, Wilson appeared before Congress and requested a declaration of war. Congress responded within days, officially declaring war on Germany on April 6, 1917. Though tensions had been brewing in Europe–and especially in the troubled Balkan region–for years before conflict actually broke out, the spark that ignited World War I was struck in Sarajevo, Bosnia, where Archduke Franz Ferdinand, nephew of Emperor Franz Josef and heir to the Austro-Hungarian Empire, was shot to death along with his wife by the Serbian nationalist on June 28, 1914. The assassination of Franz Ferdinand and Sophie set off a rapid chain of events: Austria-Hungary, like many in countries around the world, blamed the Serbian government for the attack and hoped to use the incident as justification for settling the question of Slavic nationalism once and for all. As Russia supported Serbia, Austria-Hungary waited to declare war until its leaders received assurances from German leader Kaiser Wilhelm II that Germany would support their cause in the event of a Russian intervention. Their main concern was that such an action would likely involve Russia’s ally, France, and possibly Great Britain as well. In the end, the pitted Germany, Austria-Hungary and the Ottoman Empire (the so-called Central Powers) against Great Britain, France, Russia, Italy and Japan (the Allied Powers). The Allies were joined after 1917 by the United States. The four years of the Great War–as it was then known–saw unprecedented levels of carnage and destruction, thanks to grueling trench warfare and the introduction of modern weaponry such as machine guns, tanks and chemical weapons. By the time World War I ended in the defeat of the Central Powers in November 1918, more than 9 million soldiers had been killed and 21 million more wounded. 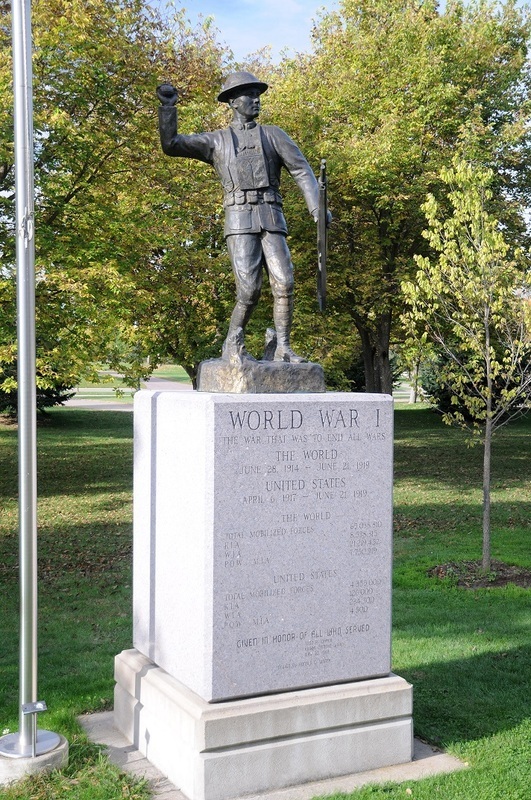 The two nations most affected were Germany and France, each of which sent some 80 percent of their male populations between the ages of 15 and 49 into battle. The war also marked the fall of four imperial dynasties–Germany, Austria-Hungary, Russia and Turkey. At the peace conference in Paris in 1919, Allied leaders would state their desire to build a post-war world that would safeguard itself against future conflicts of such devastating scale. The Versailles Treaty, signed on June 28, 1919, would not achieve this objective. Saddled with war guilt and heavy reparations and denied entrance into the League of Nations, Germany felt tricked into signing the treaty, having believed any peace would be a “peace without victory” as put forward by Wilson in his famous Fourteen Points speech of January 1918. Also known as the First World War, was a global war centered in Europe that began on 28 July 1914 and lasted until 11 November 1918. From the time of its occurrence until the approach of World War II, it was called simply the World War or the Great War, and thereafter the First World War or World War I. In America, it was initially called the European War. More than 9 million combatants were killed; a casualty rate exacerbated by the belligerents' technological and industrial sophistication, and tactical stalemate. It was the 5th-deadliest conflict in history, paving the way for major political changes, including revolutions in many of the nations involved. The war drew in all the world's economic great powers, which were assembled in two opposing alliances: theAllies (based on the Triple Entente of the United Kingdom, France and the Russian Empire) and the Central Powersof Germany and Austria-Hungary. Although Italy had also been a member of the Triple Alliance alongside Germany and Austria-Hungary, it did not join the Central Powers, as Austria-Hungary had taken the offensive against the terms of the alliance. These alliances were both reorganised and expanded as more nations entered the war: Italy, Japan and the United States joined the Allies, and the Ottoman Empire and Bulgaria the Central Powers. Ultimately, more than 70 million military personnel, including 60 million Europeans, were mobilised in one of the largest wars in history. Although a resurgence of imperialism was an underlying cause, the immediate trigger for war was the 28 June 1914assassination of Archduke Franz Ferdinand of Austria, heir to the throne of Austria-Hungary, by Yugoslav nationalistGavrilo Princip in Sarajevo. This set off a diplomatic crisis when Austria-Hungary delivered an ultimatum to theKingdom of Serbia, and international alliances formed over the previous decades were invoked. Within weeks, the major powers were at war and the conflict soon spread around the world. On 28 July, the Austro-Hungarians fired the first shots in preparation for the invasion of Serbia. As Russia mobilised, Germany invaded neutral Belgium and Luxembourg before moving towards France, leading Britain to declare war on Germany. After the German march on Paris was halted, what became known as the Western Frontsettled into a battle of attrition, with a trench line that would change little until 1917. Meanwhile, on the Eastern Front, the Russian army was successful against the Austro-Hungarians, but was stopped in its invasion of East Prussia by the Germans.